Tigard is a busy, clean, and affordable suburb located in Washington County, just 10 miles southwest of the city of Portland. Tigard truly has something for everyone, from a charming downtown commercial stretch with a farmers market and one of the best malls in Oregon. Just minutes outside of Downtown Portland, Tigard offers opportunities for business and pleasure. Downtown Tigard is experiencing a renaissance of business and community involvement, with quaint antique shops, espresso bars and fashionable eateries lining Main Street. The City government's "open door" policy encourages citizens to attend weekly city council meetings and observe the four-member council and mayor make important decisions. Tigard is truly a family-oriented community. Neighborhoods revolve around the schools and parks, summer reading program for kids and teens are offered through the library, swimming programs are offered through the school district, and organized, professional daycare services are abundant at private facilities or on-site after school. With great dining, shopping, parks, libraries, and schools, Tigard is the perfect place to raise a family and explore the best that the Northwest has to offer. As is the case with most towns in the fertile Willamette Valley, Tigard was originally settled by individual families. One of the most prominent families in the area was the Tigard family, headed by Wilson M. Tigard. The Tigards arrived in the area in 1852, when the surrounding land was known as "East Butte." The city was renamed "Tigardville" in 1886 to commemorate the efforts of the Tigard family in local business, government, and school development. In 1910, the arrival of the Oregon Electric Railway triggered the development of Main Street and pushed Tigardville from being merely a small farming community into a period of growth which would lead to its incorporation as a city in 1961. The town was renamed Tigard in 1907 by the railroad to greater distinguish it from the nearby Wilsonville. In the 1930s the streets and walks of Main Street were finally paved. The John Tigard House, constructed by the son of Wilson M. Tigard in 1880 at the corner of SW Pacific Hwy and SW Gaarde St, is still standing as a testament to these early years, having been saved from demolition in the 1970s by the Tigard Area Historical and Preservation Association. It became registered as a National Historic Place in 1979, and now resides at the corner of SW Canterbury Lane and SW 103rd. Tigard is located at the junction of Interstate 5, Highway 99W and Highway 217 - a mere 11 miles from the Portland core, offering easy access to major interstate transportation routes. Tri-Met, Portland's mass transit system, transports hundreds of people to and from Tigard daily. The Tri-Met bus transfer is located in downtown Tigard. Westside Light Rail runs east/west through neighboring Beaverton. The Portland International Airport is 25 minutes north of Tigard and is accessible via MAX Light Rail. Tigard is officially divided into 13 geographic areas around elementary schools and major transportation routes. Each neighborhood has been assigned an area number, 1-13, however some of the neighborhoods carry unofficial names long associated with them prior to their current numeric designations. Area 2 is often called Summerlake after Summerlake Park. Area 3 includes the historic Greenburg neighborhood. Area 4 is called either North Tigard or, more commonly, Metzger (though much of Metzger lies in unincorporated Washington County). Area 5 is commonly referred to as the "Tigard Triangle," with Oregon Highways 99W and 217 forming two sides of the triangle and Interstate 5 forming the other side. The city of Tigard falls mostly under the jurisdiction of the Tigard-Tualatin School District, however some of the northwestern most part of the city falls under the jurisdiction of the Beaverton School District. The Tigard-Tualatin School District contains 10 elementary schools, 3 middle schools, and 2 high schools. Tigard is home to Tigard High School, Fowler Middle School, Twality Middle School, Alberta Rider Elementary, CF Tigard Elementary, Durham Elementary, Mary Woodward Elementary and Templeton Elementary. In Tigard, community activity revolves around close-knit, family-oriented neighborhoods. There are many comfortable older neighborhoods in beautiful condition, and Tigard is growing by leaps and bounds. Lovely new homes and new neighborhoods are springing up in rapid progression. One of the fastest growing areas is beautiful Bull Mountain with a view of the Willamette Valley and the Cascade Range. If you're interested in Tigard Real Estate, land and homes for sale in Tigard, or have any questions about relocating to Portland and Portland area suburbs, don't hesitate to contact the McDonald Group Realtors, your guide to Tigard Real Estate. "Art Resources in Tigard" is a grassroots committee that actively promotes art in Tigard. Tigard is also home to the Deb Fennel Auditorium which hosts the professional Broadway Rose Theatre. With computer-controlled lighting and sound systems, the 600-seat air conditioned facility spotlights the talents of the school's award-winning music and theater groups as well as touring professional artists. Tigard Farmers' Market: Many vendors bring the fruits of the surrounding agricultural land to the parking lot at Young's Funeral Home (11831 SW Pacific Highway) in Tigard each Sunday from mid-May through October. This weekly gathering place for friends and neighbors features fun, food and entertainment, plus locally grown fresh vegetables, fruit, flowers, plants, honey, baked goods and more. See Tigard Farmer's Market Website for additional information. City Festivals: Tigard is home to a variety of community festivals that bring families and adults together to enjoy the cultural and outdoor bounty of the region. 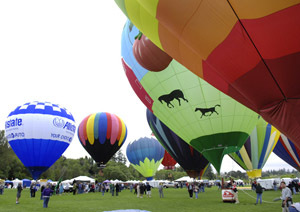 Festivities include the Festival of Balloons held at Cook Park as part of the Portland Rose Festival, 4th of July fireworks at the Tigard High School stadium and the annual Downtown Tree Lighting that takes place the first weekend in December. The City of Tigard also hosts a three-day Family Festival in September that boasts events for the whole family, including a 5k Fun Run/Walk and a fireworks display. Events take place in downtown Tigard and at the Tigard Public Library. Parks and Recreation: Tigard features many opportunities for activity and recreation including several public and private golf courses, city parks, outdoor tennis courts, bike and pedestrian paths and the Tigard High School Swim Center. The 79-acre Cook Park is the largest of 7 neighborhood and community parks. Cook Park is located along the banks of the Tualatin River and is currently undergoing a 3-phase expansion which will include many new amenities. Summerlake Park and Fanno Creek Park are unique havens to waterfowl and wildlife in the middle of the busy suburban community. Washington Square: one of the Northwest's largest climate controlled shopping malls is in Tigard. It features newly remodeled major department stores including one of the largest Nordstrom stores on the West Coast. Washington Square has undergone a dramatic change in recent years, adding shops such as Abercrombie & Fitch, Aldo, Coach, Eddie Bauer, J. Crew and Pottery Barn to its repertoire. Bavarian Sausage Delicatessen: 8705 SW Locust St - This family owned deli serves up classic German fare, including home made sausages, cold cuts, meat spreads and salami. Their prices are amazing for both dine-in sandwiches and and takeaway meats. Their German potato salad is amazing! The atmosphere is very european with all sorts of collectibles hanging on the walls. They also have a wonderful German bakery, with German-style sourdough rye bread, appelstrudel, and their famous pretzels! George's Giant Hamburgers: 11640 SW Pacific Hwy - This is an old-fashioned burger bar, with fresh-ground meat that is never frozen. They've got simple, good food that will fill you up! Try the George's Special, with bacon and cheese and sauteed onions and mushrooms. At George's, you really get it "your way" with the signature condiment bar, with plenty of fresh tomato, lettuce, onion, sweet relish and burger sauces to suit your own taste. Maki Sushi: 12430 SW Main St - This is a gem of a sushi joint in Tigard, serving truly fresh food. The atmosphere at Maki is top notch, they've got REAL wooden chopsticks (not the cheap disposable kind that gives you splinters), and the staff is extremely friendly and attentive. You should always try to check their website for their weekly specials, which are fresh and amazingy delicious. Our favorites include the Otsumami, or Japanese tapas, like butter sautéed matsutake mushroom, Matsutake chawanmushi (matsutake egg custard), Maguro kakuni (braised tuna), and Saba misoni (simmered mackerel in miso sauce). Pacific Breeze: 11525 SW Durham Rd - This reliable joint serves up great Thai and Vietnamese food in a cozy environment. It's tucked away in a strip mall, but it's well worth the effort to get there. They've got some of the best curry in town, and all of their dishes save some of the appetizers are available as vegetarian versions. McMenamins Greenway Pub: 12272 SW Scholls Ferry Rd - This Tigard outpost of the McMenamins pub family is a great place to gather with friends, shoot some pool, and eat some great local food. The outdoor patio is good for warm summer nights, and there's plenty of room inside for larger groups when it's chilly outside. You've got to check out this great pub for the fish tank alone! It's filled with a variety of saltwater creatures that provide plenty of amusement for patrons. Betty, a porcupine puffer and the unofficial pub mascot, is the star attraction. She swims amongst many other beauties, including an orange-spotted grouper, a dogface puffer and a tang lionfish named Alfred III.